And really- I do love my birthday, but that sense of excitement I feel at the top of September is about so much more than that. Historically, it's just always been a great time for me. I LOVE that crisp, new, Back To School feeling, the changing light, the Harvest moon &, of course, the Autumn Equinox. There will be soup! There will be rain! And sweaters & boots & pumpkin spice everything! 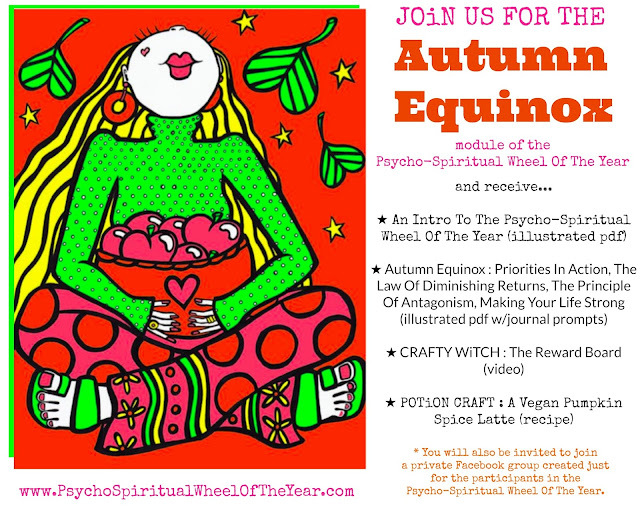 And- if you love Fall as much as I do & you're looking to really make the most of September, you might wanna check out the Autumn Equinox module of The Psycho-Spiritual Wheel Of The Year. LOVE that song!!! Happy Birthday to YOU happy birthday to YOU!!! Happy Birthday month to Joannnnnaaaa!!!! Yay!!!! Woo Hoo!!! Yay!!! I'm so excited it is your Birthday Month!!! !